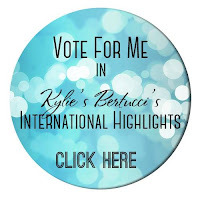 Welcome to Kylie Bertucci's June 2018 International Blog Highlights. 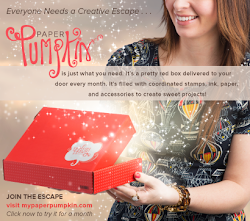 You are able to vote for my project and the top 10 winners will be invited to participate in an international blog hop. I'd love it if you could vote for my project. You can do so here: http://bit.ly/VoteForMeKyliesHighlightsJune. This months theme is friendship. There's nothing quite like checking the mail and finding a handmade card for no reason other than to let a friend know that they are loved and appreciated. Who wouldn't love to receive mail like that?! I created this card to send to a friend who I appreciate for so many different reasons. I hope it brightens her day. I created the background by stamping the little images from the Detailed with Love stamp set with VersaMark ink, onto a 3-3/4" x 5" piece of glossy cardstock. After heat setting them, I used a sponge brayer and petal pink ink to create an ombre look. It's hard to tell from the photo but it's lighter at the bottom and then gets gradually darker. This was then added to a 3-7/8" x 5-1/8" piece of shaded spruce cardstock and that to a petal pink card base. The greeting is stamped in shaded spruce ink onto whisper white cardstock and then punched out using the pretty label punch. This was added to a 1-3/4" shaded spruce circle and then that onto the longer narrow shape from the stitched labels framelits (I LOVE these framelits!!) cut from petal pink cardstock. The ribbon is from the metallic ribbon combo pack. If you like my project, I'd love for you to vote for it! Just click on the button below, it will take you to Kylie's gallery. Just click on the heart in the corner of my Life is Sweeter card! Thank you! Shop my Canadian online store!